Brands are better for users. They provide an implicit guarantee of expectations. A strong brand delivers consistent, expected results to its users, inspires confidence. a gigantic multi national might not always provide a better experience for individual customers, but arguably on the whole they do. People associate themselves with brands to the extent that the brand experience becomes central to the product experience. Mobile phones are a classic example of this. You can buy plenty of different Android devices, but you’d rather buy a Samsung than a Meizu, even if they have the same chip set and screen, because of brand. iPhone 4 might be inferior as a device to the Nexus S, but it sells better, because of brand. The Internet is fast becoming a ‘cesspool’ where false information thrives … Brands are the solution not the problem. Brands are how you sort out the cesspool. It’s incredibly easy for online businesses to detach themselves from their customers and fail to recognise what the company might mean. A generic website that sells generic products and gets all its traffic from generic search terms is one which stifles loyalty and limits meaningful engagement. Without any engagement there is no business-consumer relationship, and the long term prospects for customer retention are limited. There is simply no reason for a user to come back to the site when any other site can provide them with a similar generic experience. You get a great example of user trust and branding when you look at conversion data. And you’re right, but part of the sale process is establishing the rapport with the customer and encouraging them to return. The data above is not from a discounter, if anything the site is more expensive than it’s ranking competitors, but it has a more identifiable brand. Of course, Google isn’t a person, it can’t engage with a brand emotionally but it can extrapolate information about what engagement looks like, and use this to identify a brand algorithmically. Promoting such brands in the SERP, it creates a user experience that is more trusted and in line with Eric Schmidt’s escape from the cesspool philosophy for search. What are the factors that Google can use to determine whether a website is a brand? Google have a lot of CTR information about their search results, we’ve all seen the various studies into CTR from the SERPS and used it for forecasting traffic. If a website out performs expectations for a given position in the results, its a clear indicator that it is a stronger traffic magnet than the websites around it. The Google search cookie tracks a lot of your behaviour including which results you click on for a given search. If one site has a consistently higher bounce rate than competitors, then it’s providing a relatively poorer user experience. If a lot of people return to a website after their initial visit, then it suggests that it provided a better experience the first time they visited. 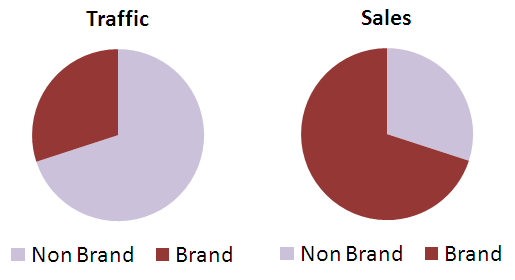 If a higher than average number of people make a navigational search for a website (ie Google domain.com), this indicates a preference for that brand within the vertical. The number of sites within the Google index that link to a particular website using brand rather than generic anchor text. Like the brand+generic search volume it is an indicator that only that version of the product will do. All of the points above are “relative” to the SERP. The fact is that most businesses are not Apple, and most industries don’t have an Apple either. You don’t need to brand competitive to companies like Google to establish yourself, you just need to brand relative to the companies you compete with.